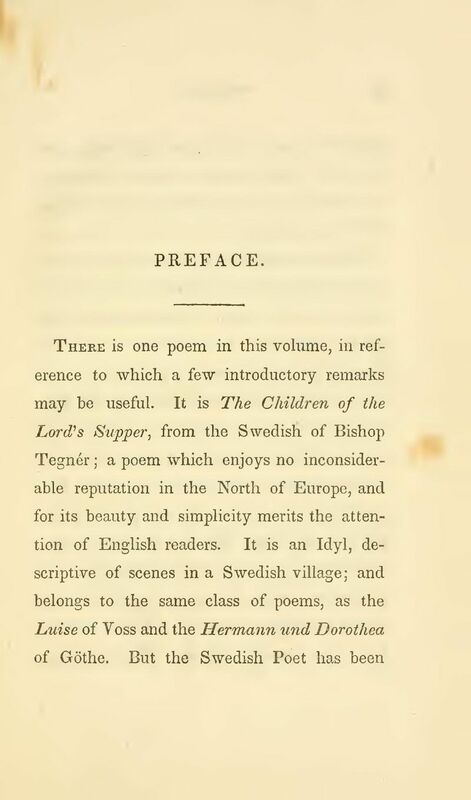 There is one poem in this volume, in reference to which a few introductory remarks may be useful It is The Children of the Lord’s Supper, from the Swedish of Bishop Tegnér; a poem which enjoys no inconsiderable reputation in the North of Europe, and for its beauty and simplicity merits the attention of English readers. It is an Idyl, descriptive of scenes in a Swedish village; and belongs to the same class of poems, as the Luise of Voss and the Hermann und Dorothea of Göthe. But the Swedish Poet has been guided by a surer taste, than his German predecessors. His tone is pure and elevated; and he rarely, if ever, mistakes what is trivial for what is simple. There is something patriarchal still lingering about rural life in Sweden, which renders it a fit theme for song. Almost primeval simplicity reigns over that Northern land, — almost primeval solitude and stillness. You pass out from the gate of the city, and, as if by magic, the scene changes to a wild, woodland landscape. Around you are forests of fir. Over head hang the long, fan-like branches, trailing with moss, and heavy with red and blue cones. Under foot is a carpet of yellow leaves; and the air is warm and balmy. On a wooden bridge you cross a little silver stream; and anon come forth into a pleasant and sunny land of farms. Wooden fences divide the adjoining fields. Across the road are gates, which are opened by troops of children. The peasants take off their hats as you pass; you sneeze, and they cry, “God bless you.” The houses in the villages and smaller towns are all built of hewn timber, and for the most part painted red. The floors of the taverns are strewn with the fragrant tips of fir boughs. In many villages there are no taverns, and the peasants take turns in receiving travellers. The thrifty housewife shows you into the best chamber, the walls of which are hung round with rude pictures from the Bible; and brings you her heavy silver spoons, — an heirloom, — to dip the curdled milk from the pan. You have oaten cakes baked some months before; or bread with anise-seed and coriander in it, or perhaps a little pine bark. Meanwhile the sturdy husband has brought his horses from the plough, and harnessed them to your carriage. Solitary travellers come and go in uncouth one-horse chaises. Most of them have pipes in their mouths, and hanging around their necks in front, a leather wallet, in which they carry tobacco, and the great bank notes of the country, as large as your two hands. You meet, also, groups of Dalekarlian peasant women, travelling homeward or town-ward in pursuit of work. They walk barefoot, carrying in their hands their shoes, which have high heels under the hollow of the foot, and soles of birch bark. Near the church-yard gate stands a poorbox, fastened to a post by iron bands, and secured by a padlock, with a sloping wooden roof to keep off the rain. If it be Sunday, the peasants sit on the church steps and con their psalm-books. Others are coming down the road with their beloved pastor, who talks to them of holy things from beneath his broad-brimmed hat. He speaks of fields and harvests, and of the parable of the sower, that went forth to sow. He leads them to the Good Shepherd, and to the pleasant pastures of the spirit-land. He is their patriarch, and, like Melchizedek, both priest and king, though he has no other throne than the church pulpit. The women carry psalm-books in their hands, wrapped in silk handkerchiefs, and listen devoutly to the good man’s words. But the young men, like Gallio, care for none of these things. They are busy counting the plaits in the kirtles of the peasant girls, their number being an indication of the wearer’s wealth. It may end in a wedding. I will endeavour to describe a village wedding in Sweden. It shall be in summer time, that there may be flowers, and in a southern province, that the bride may be fair. The early song of the lark and of chanticleer are mingling in the clear morning air, and the sun, the heavenly bridegroom with golden locks, arises in the east, just as our earthly this the host replies, “Yes; were you seven times as many, you should all be welcome; and in token thereof receive this cup.” Whereupon each herald receives a can of ale; and soon after the whole jovial company comes storming into the farmer’s yard, and, riding round the May-pole, which stands in the centre, alights amid a grand salute and flourish of music. The dinner is now served, and the bride sits between the bridegroom and the priest. The Spokesman delivers an oration after the ancient custom of his fathers. He interlards it well with quotations from the Bible; and invites the Saviour to be present at this marriage feast, as he was at the marriage feast in Cana of Galilee. The table is not sparingly set forth. Each makes a long arm, and the feast goes cheerly on. Punch and brandy pass round between the courses, and here and there a pipe is smoked, while waiting for the next dish. They sit long at table; but, as all things must have an end, so must a Swedish dinner. Then the dance begins. It is led off by the bride and the priest, who perform a solemn minuet together. Not till after midnight comes the Last Dance. The girls form a ring around the bride, to keep her from the hands of the married women, who endeavour to break through the magic circle, and seize their new sister. After long struggling they succeed; and the crown is taken from her head and the jewels from her neck, and her boddice is unlaced and her kirtle taken off; and like a vestal virgin clad all in white she goes, but it is to her marriage chamber, not to her grave; and the wedding guests follow her with lighted candles in their hands. And this is a village bridal. Nor must I forget the suddenly changing seasons of the Northern clime. There is no long and lingering sirring, unfolding leaf and blossom one by one; — no long and lingering autumn, pompous Avith many-colored leaves and the glow of Indian summers. But winter and summer are wonderful, and pass into each other. The quail has hardly ceased piping in the corn, when winter from the folds of trailing clouds sows broad-cast over the land snow, icicles, and rattling hail. The days wane apace. Ere long the sun hardly rises above the horizon, or does not rise at all. The moon and the stars shine through the day; only, at noon, they are pale and wan, and in the southern sky a red, fiery glow, as of sunset, burns along the horizon, and then goes out. And pleasantly under the silver moon, and under the silent, solemn stars, ring the steel-shoes of the skaters on the frozen sea, and voices, and the sound of bells. From his swallow’s nest in the belfry he can see the sun all night long; and farther north the priest stands at his door in the warm midnight, and lights his pipe with a common burning glass. Esaias Tegnér, the author of this poem, was born in the parish of By in Wärmland, in the year 1782. In 1799 he entered the University of Lund, as a student; and in 1812 was appointed Professor of Greek in that institution. In 1824 he became Bishop of Wexiö, which office he still holds. He stands first among all the poets of Sweden, living or dead. His principal work is Frithiofs Saga; one of the most remarkable poems of the age. This modern Scald has written his name in immortal runes. He is the glory and boast of Sweden; a prophet, honored in his own country, and adding one more to the list of great names, that adorn her history. Teksten følger Henry Wadsworth Longfellow: Ballads and other Poems, 2nd edition, John Owen, Cambridge, 1842, pp. VII-XXV. * Titles of Swedish popular tales.